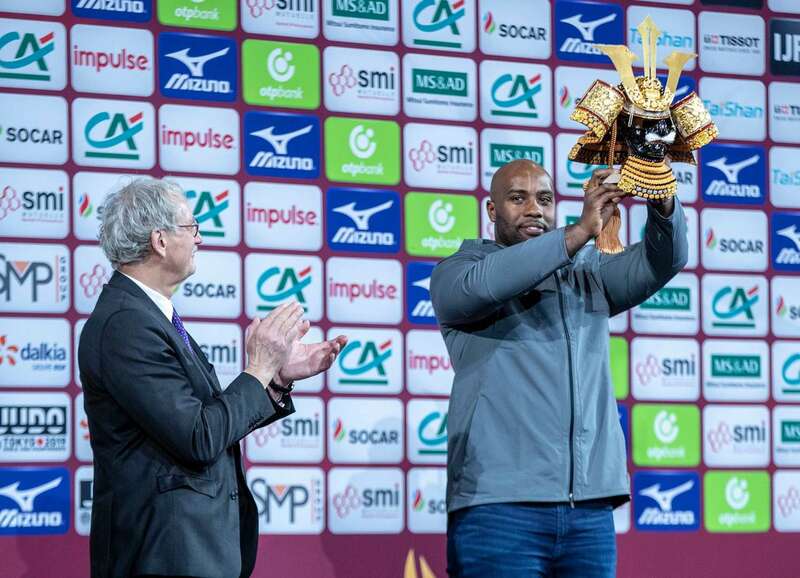 This may be what the Parisian public will remember from the ceremony in honor of Teddy Riner: the ten-time world champion has announced that he will return to the tatami of the Accord Hotel Arena for the Paris Grand Slam 2020. But Beyond this announcement that has delighted the 15,000 spectators beyond imagination, the French also received his sixth dan from the hands of the President of the IJF, Marius Vizer and a Kabuto (Japanese samurai helmet) from Jean-Luc Rougé, President of the French Federation, in honor of his incredible career so far. Asked about his ten world titles, Teddy said: "Every world title has a special flavor. But if I had to retain one it would obviously be the one I won here in 2011, in front of my fans. I also have a particular attachment to my first world title in Rio in 2007. A first world title is always different." The champion, however, is far from satisfied and his career is far from being over: "For the moment I am preparing to qualify for the Tokyo Games. I resumed training three weeks ago. I hesitated to come this year to Bercy to compete, but my coaches dissuaded me to fight. But I can tell you that in 2020, I will be back in front of you to add a new Grand Slam title to my list. In 2020, I want to win my third Olympic title in Tokyo, and for that, I need to prepare myself in the best possible way. The Paris Grand Slam is unavoidable." 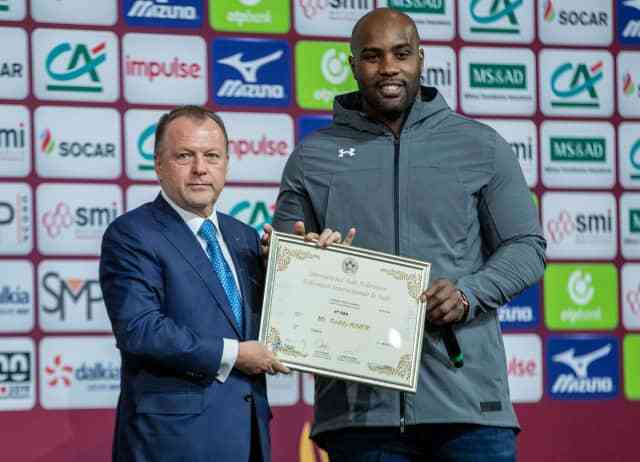 After a year away from the tatamis of the World Judo Tour, the colossus, dropped down in the world ranking and, as pointed out by the host of the ceremony, Frederic Lecanu, this does not happen often to Teddy to fall down. But he is already seeing beyond Tokyo. His dream is to put an end to his extraordinary career at the Paris Olympics in 2024. The President of the FFJ, Jean-Luc Rougé, could only approve: "Teddy, what I just heard warms my heart. In 2024, we will all be there, not exactly at Bercy, since the Olympic tournament will take place in a stadium built at the foot of the Eiffel Tower, but we will be in Paris to see you." At the presentation of his sixth dan, President Marius Vizer said: "Teddy, it is a great honor for the French and international judo family to be able to count on a champion of your dimension. You are a model for judokas around the world. I want to congratulate you for this high rank, but also for everything you have already brought to judo." 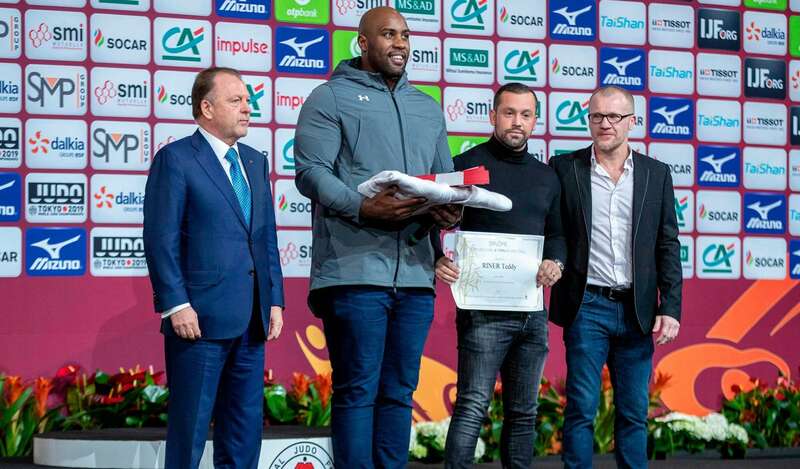 On the occasion of the delivery of his new red and white belt, Teddy Riner was accompanied by his three 'godfathers': the President of the IJF himself, as well as Fred Escalante, his best friend who fought against the disease and his first judo teacher, Alain Perrier: "First of all, I want to thank President Vizer for giving our sport a new dimension. I also wanted to be accompanied by my best friend as well as the one who made me love judo," said Riner, before adding:" Sometimes I'm called 'master' on the tatami, this time I may say that I have become one. Beyond the joke, being sixth dan forces me to be even more exemplary. Judo is the way, it is a way of life and I will continue to walk along this beautiful path." It is not certain that the announcements made today delights everyone. The opponents of the French giant can still have concerns in the years to come on how to defeat him. But what is certain is that Teddy Riner's 6th dan and his willingness to continue to delight judo fans all the way to Tokyo, or even beyond, are excellent news for the sport, both in France, as well as at a global level. Still far from the competition tatamis, Teddy is getting closer and we will see the ten-time world champion and double Olympic champion soon on the circuit. After the official ceremony Teddy Riner was led to the central tatami to his surprise. To honor ‘their’ champion, the 15,000 fans in the Accor Hotel Arena rose from their seats and sang the French national hymn ‘La Marseillaise’ a cappella for their hero. 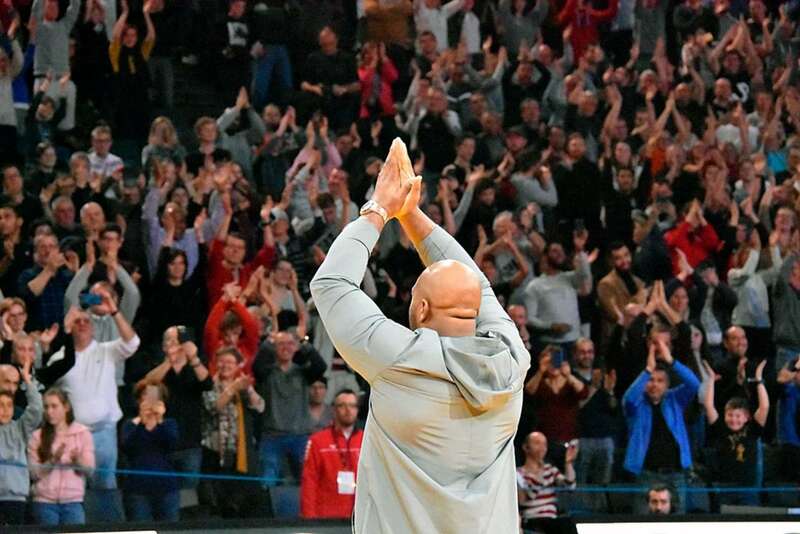 At the end of this chilling tribute, the French judo legend once again promised his return to the Paris Grand Slam next year which was welcomed by loud cheers from the crowd.